Born in Cypress River, Manitoba, Young began his writing career in 1936 when he joined the Winnipeg Free Press. He wrote a few well-received juvenile novels, one was Scrubs on Skates and then he branched out into factual sports information. He left Winnipeg in 1940 for Toronto where he joined the Canadian Press, later Maclean's and then the Globe and Mail. While in Toronto, Young annoyed some of the NHL brass and at one time was barred from Maple Leaf Gardens. 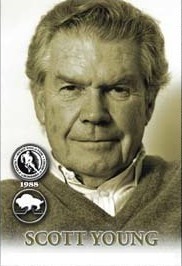 After over forty books, his name is still synonymous with excellent hockey writing. Among his many fiction and non-fiction books are Hello Canada, a biography of Foster Hewitt; War on Ice and The Boys of Saturday Night.